Shake with ice and strain into a glass filled with cracked ice. Decorate with fruits, berries, and mint. 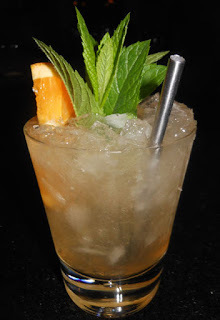 After the Cortez Julep, I found a recipe in Pioneers of Mixing at Elite Bars: 1903-1933 that would well utilize the extra mint sprigs that I picked from our garden. That drink, the White House, appeared to be a rum Fix, but it did not appear in the Fix section of that chapter on rum recipes. Once mixed, the mint contributed greatly to the White House's nose. A grape and lemon sip led into the rum on the swallow along with the Madeira and its sharp and smoky notes.